Alien lifeforms may fill their home planets' skies with stinky sulfur-based chemicals rather than oxygen, researchers say. If Professor Hubert Farnsworth's "Smell-O-Scope" actually existed, astrobiologists would have pointed it at dozens of alien planets by now. The Professor's odor-detecting invention, which was featured in several episodes of the animated sci-fi series "Futurama," would be a good life-hunting tool, researchers say, because alien organisms may betray their presence by pumping stinky chemicals into their home planets' skies. Domagal-Goldman and other researchers spend a lot of time thinking about the best biosignatures, or signs of life, to look for in the atmospheres of faraway planets. Two good candidates are oxygen and methane, both of which disappear from atmospheres without replenishment. 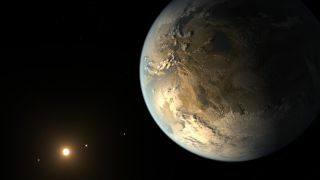 While each substance can be created by geological as well as biological processes, detecting both oxygen and methane in an exoplanet's skies simultaneously would be strongly suggestive of alien life, many scientists say. "They destroy each other," Domagal-Goldman said. "If they're both there together, you know someone is bringing the methane in an atmosphere rich in oxygen, so that's what you're looking for. The most likely explanation is, it's life that's bringing the methane and oxygen to the party." The methane-oxygen strategy is informed by the biosignatures that currently swirl in Earth's skies: Plants and cyanobacteria generate oxygen, while many other types of bacteria, as well as animals, pump out methane. But a comprehensive hunt for alien biosignatures should also look deeper into Earth's biological history, drawing further inspiration from the planet's pioneering first organisms, Domagal-Goldman stressed. Life first appeared on Earth perhaps 3.7 billion years ago and had become indisputably established by 3.5 billion years ago, scientists say. It took a long, long time, however, for the biosphere we're familiar with today to take shape. Simple microbial life dominated the planet for billions of years, with complex multicellular forms getting a firm foothold just 800 million years ago or so. And while oxygen-producing cyanobacteria may have evolved as early as 3 billion years ago, oxygen apparently didn’t start accumulating in the planet's atmosphere until 2.3 billion years ago or so, said Tim Lyons of the University of California-Riverside, who also participated in the NASA panel discussion last month. So the oxygen-methane strategy would not have picked up signs of life on the early ("Archaean") Earth, even though the planet was teeming with organisms — just as it may result in false negatives when applied to exoplanets as well, researchers said. But studying the microbes that thrive today in Earth's oxygen-free environments suggests a way to broaden the search for alien life. For example, Archaean life probably released some pretty stinky stuff into the ancient planet's air, such as sulfur-methyl gases, which Domagal-Goldman recalled smelling while walking past a colleague's lab. "They don't last long in modern-day Earth's environment because they get oxidized," he said. "But if you went back to the Archaean, or any planet without oxygen, and you had life making these gases — which they clearly do; I detected them myself — then they might have built up enough for us to see with a telescope from far away." Scientists have proposed looking for other biosignatures as well, including industrial pollutants such as cholorfluorocarbons that could be indicators of advanced alien civilizations. Of course, even looking back to the biosignatures of ancient Earth still involves a very large assumption — that alien life will probably resemble Earth life in important ways. That would seem to suggest that it will be tough to detect lifeforms vastly different from those of Earth — organisms with exotic and undreamed of metabolic pathways. But Lyons thinks astrobiologists shouldn't view the challenge as insurmountable. "We have chemical principles, and we hope that those are universal," Lyons said. "Life today is about the flow of electrons amongst bacteria, simple, single-celled organisms. And so if you had a sense for the chemistry on that [alien] planet that you're inferring from an atmosphere, you could start to envision reactions that could lead to that chemistry that could be a source of energy."